jrowberg.io - Programming. Electronics. Open-source. Pseudo-random opinions. 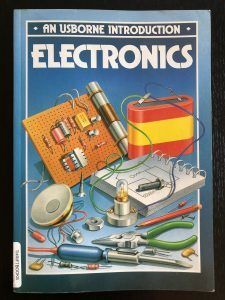 In my last post, I described some of the early influences that directed me onto the path of working with electronics for a career. However, I didn’t mention an important piece that caused me to dip my toe into programming as a hobby. 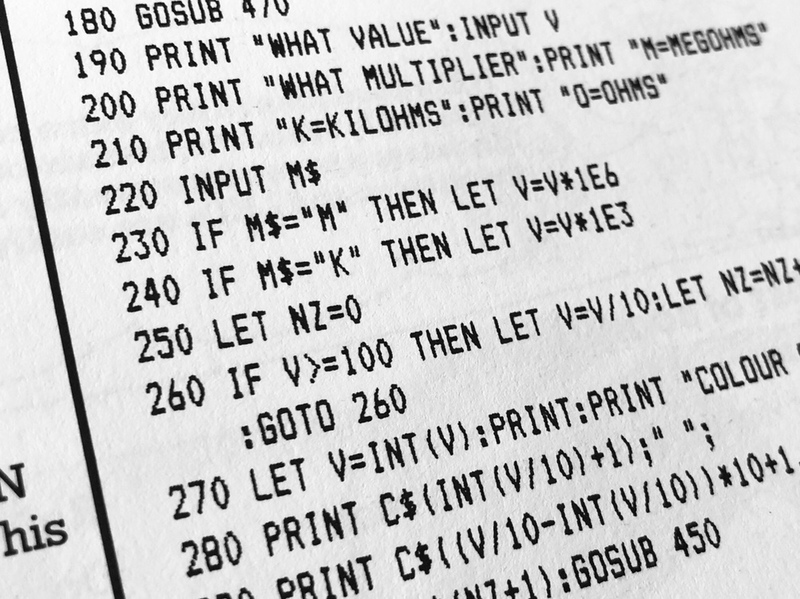 Since my job today entails at least equal parts of hardware and software—and since I just got an old copy of a very special book—it’s time to describe my introduction to writing code as well. 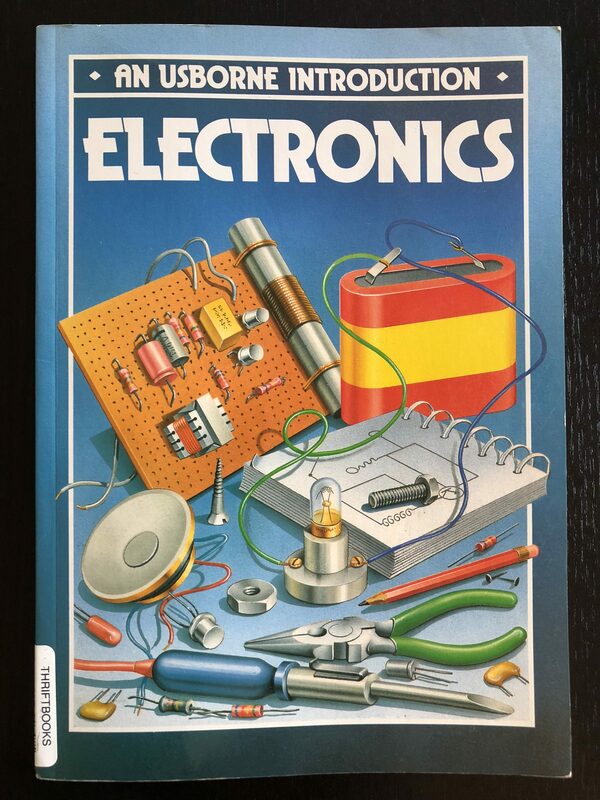 When I was seven, we had some Usborne “Introduction” series books covering a variety of different science-y topics, including electronics, physics, and chemistry. 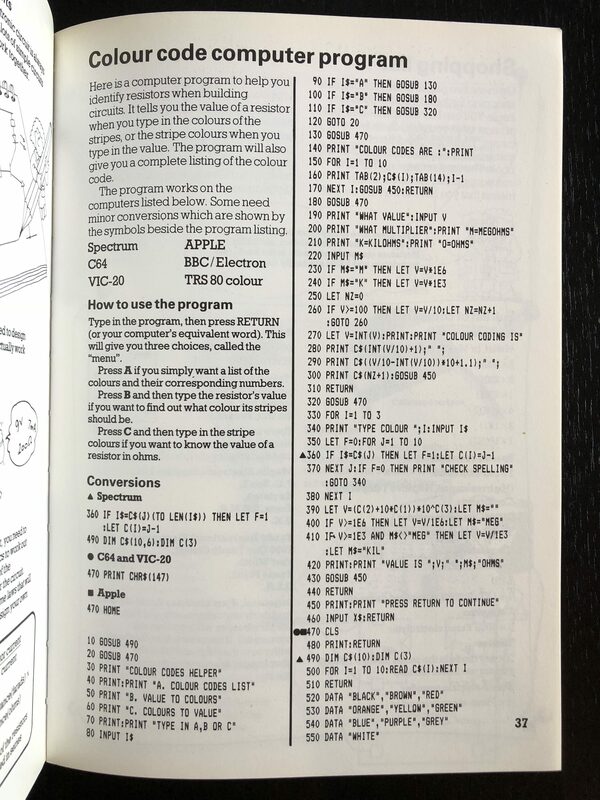 I don’t remember how much of the actual content of those books I absorbed, but I clearly remember being enamored with the BASIC code listings that some of them had towards the back, starting with the resistor color code program in the back of the electronics book. 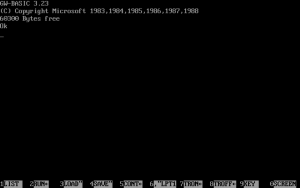 My dad had a ‘286 PC that had GW-BASIC on it, and so with book in hand I began painstakingly transcribing the code listing from the book into the arcane black-and-white editor. I hadn’t yet developed any typing ability to speak of, so it took a very long time. 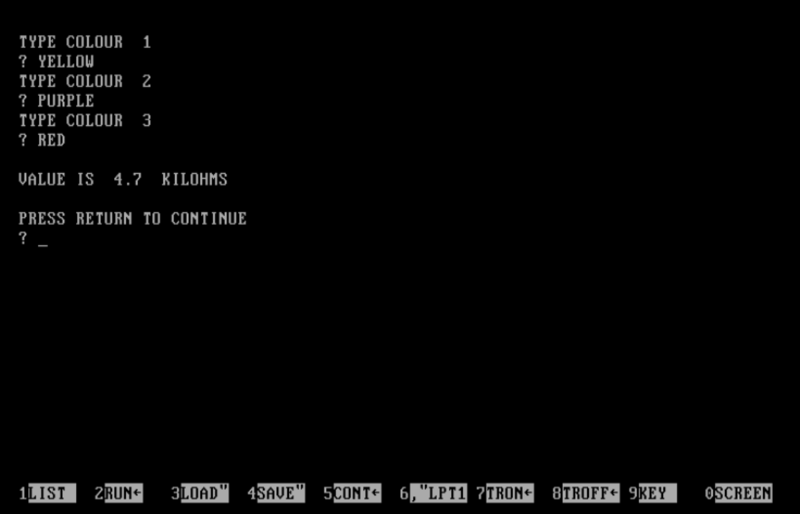 Regardless, I eventually got it to work, and I was fascinated. My computer did something that I told it to! 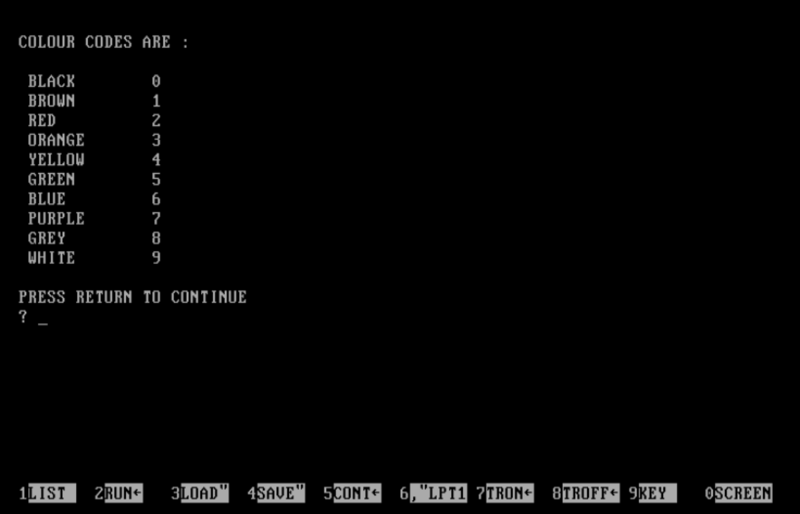 Not only that, but the program actually translated between numeric resistor values and color codes, which was doubly fascinating since I’d just learned how to do that by hand as well. 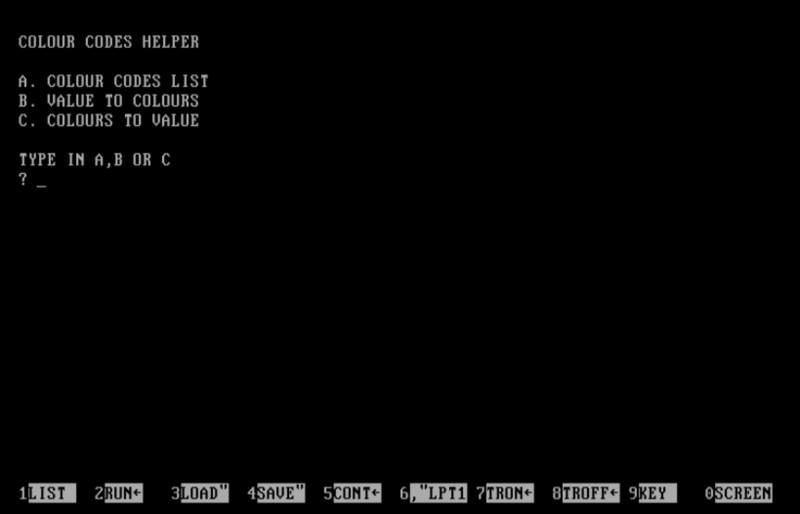 The interface is plain, yet functional. The code notes potential color misspellings and prints an error message, which is a nice touch. After that initial accomplishment, I looked for similar code listings in everything I could find: other Usborne books, introduction to programming books, science books, anything remotely related that I could locate at the library. I didn’t have a good grasp of what the code actually did; I just knew it would probably work if I copied it correctly. Really, that’s not a bad way for a seven-year-old to start out. 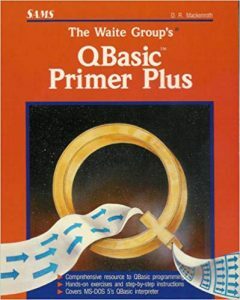 The slightly deeper understanding began when my dad brought home the beautiful orange QBasic Primer Plus from The Waite Group, complete with all kinds of step-by-step training and the glorious Goki Blaster and fractal generation programs towards the end. 30 PRINT "COLOUR CODES HELPER"
40 PRINT:PRINT "A. COLOUR CODES LIST"
50 PRINT "B. VALUE TO COLOURS"
60 PRINT "C. COLOURS TO VALUE"
70 PRINT:PRINT "TYPE IN A,B OR C"
200 PRINT "WHAT MULTIPLIER":PRINT "M=MEGOHMS"
270 LET V=INT(V):PRINT:PRINT "COLOUR CODING IS"
400 IF V>=1E6 THEN LET V=V/1E6:LET M$="MEG"
410 IF V>=1E3 AND M$<>"MEG" THEN LET V=V/1E3:LET M$="KIL"
420 PRINT:PRINT "VALUE IS ";V;" ";M$;"OHMS"
450 PRINT:PRINT "PRESS RETURN TO CONTINUE"
Reading quickly through the code had me scratching my head for a minute trying to work out the flow, since it is full of GOSUB and RETURN and GOTO statements, presented as a single block of 55 numbered lines with no indentation or comments and many lines with multiple statements chained together. Compact? Yes. Functional? Yes. Clear? Not so much. I mean, not that I blame them for omitting comments and indentation from a simple code listing in the back of a science book from 1985. Nevertheless, it’s not hard to follow once you get your head back into old-school mode. 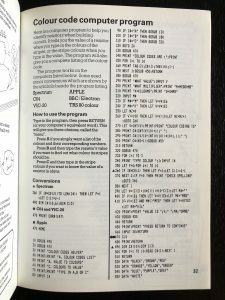 If any readers are so inclined, you can copy and paste this code into PC-BASIC on any modern computer. 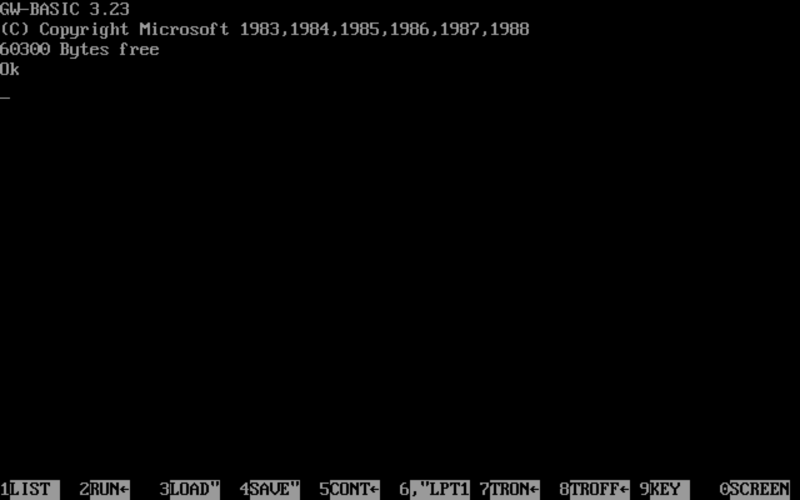 That’s what I used here, since I no longer have that ‘286 available. The GW-BASIC interpreter parses the entire listing before execution, including those last “DATA” statements at the end. 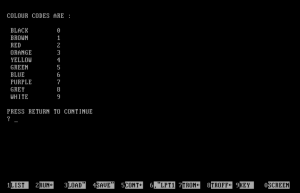 The values declared as DATA elements are available via the READ statement, which is what the (pseudo) subroutine that I’ve labeled “LoadData” does: it creates a 10-element string array called “C$” and then iterates with a FOR loop to load each string value into the corresponding array index. 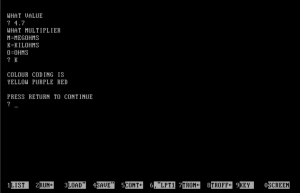 Once the data is loaded, the program enters the “PrintMenu” routine, where it lives until it is terminated. 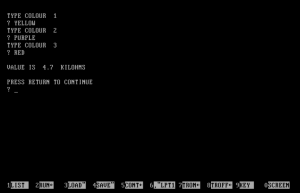 This routine displays the choices, waits for a single user input, reacts based on the input, and then jumps back to the beginning of the routine (“GOTO 20”) in an infinite loop. Since this code was published over three decades ago, I thought it might be fun to port it over to a more modern language. I chose Python 3 because it’s currently familiar to me and fits with the earlier choice of BASIC for a low-effort interpreted language of convenience. I’ve chosen to retain the basic structure of the original code despite potential simplifications, just to make the translation more obvious. I even kept the British spelling of “colour” intact. I used Python’s convenient str.upper() function to make the menu selection, color entry, and multiplier entry inputs case-insensitive, which is a minor improvement on the original code. I also threw in some extra spaces around the resistor value to imitate GW-BASIC’s idiosyncratic habit of forcing numbers to be surrounded by spaces in PRINT statements. And since Python uses the carat (‘^‘) character as an XOR operator, I had to swap that out for the built-in pow() function. Finally, I threw in that input/raw_input bit at the top to allow this code to run in either Python 2.x or 3.x without issues. 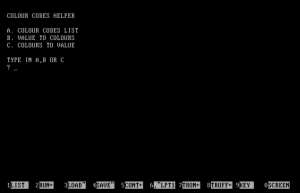 Otherwise, the structure and functionality of this fun little program have remained unchanged. Start-to-finish walkthrough for the hardware and software setup process using Home Assistant with a variety of other services for a home automation system. With our 8-month-old daughter Julia, my wife and I have made liberal use of various types of white noise to help her sleep. Let’s make a perfect solution with a Raspberry Pi! InMojo is an excellent sales platform for open-source hardware products. However, it is missing an official API to automate order and customer management. It’s January 1st, 2015, and you know what that means: I have a sudden urge to write. I don’t know exactly why this always happens, but it’s pretty predictable. A few big things happened this year, or at least began happening. I’ll go through them one by one. in the last many months, I’ve gone full-bore on my Keyglove project right up until exhibiting it at Open Hardware Summit and Maker Faire in New York right at the end of September, followed immediately by an unplanned but very fortuitous job change to Bluegiga Technologies, which involved a week in Atlanta, then two weeks in Finland, then another week in Chicago, all in October. Wow.